A house maid with a dark past, a marriage with a painful secret, and a conniving houseguest make for a twisted tale that keeps you guessing until the bitter and shocking end. Cat Morley is recruited to live with the vicar and his wife and serve them as an employee, and the goings-on of the house from the moment she arrives are enough to make a person dizzy. Albert, the vicar, spends most of his spare time wandering alone in the woods looking for “spirits”, the housekeeper seems to want her fired, and the halls of the house seem to whisper secrets that are just out of hearing. When reknowned “theosopher” Robin Durrant comes to stay in the house as a very long-term houseguest, tensions begin to rise for everyone under the roof, including the staff. Who is this man and what are his intentions? Can he really be serious about the “spiritual beings” he claims to see in the woods? Can Albert, a holy man, really be taken in by Robin’s ridiculous philosophy and “scientific” ideals? Hester, Albert’s wife, can see the water rising, but can’t seem to open her husband’s eyes to the swamp of deceit that is welling up around them. Almost a hundred years later, Leah is a journalist who sets out to identify remains discovered on an old World War I battle site. Letters from a woman to the soldier are all that she has to go by as she begins her search for the truth. What is the secret of the Rectory that has been buried for so many decades? Who is the dead soldier, and what are his connections to the woman in the letter? Was there a scandal covered up all those years ago? As the truth is slowly unearthed, Leah finds herself growing closer and closer to the great-great-grandson of Hester and Albert Canning. But what happens when her ex shows up and wants her back in his life? This tale skips between the past and the present with a gloomy, intense style very similar to Kate Morton (The Distant Hours, The Forgotten Garden, The House at Riverton) and Kimberley Freeman (Wildflower Hill)-full of mystery and deep, dark family secrets. 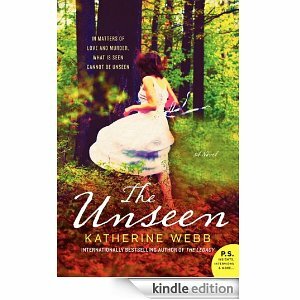 If you enjoy this type of literature, you will not want to miss Katherine Webb’s “The Unseen“, and you may find that her other works tickle your fancy, as well. A brilliant review of a book I haven’t heard of. I love the Kate Morton books and Katherine Webb and thank you for bringing a new author for me to look at. Have you tried Rachel Hore? If not she also writes books a little similar in style. No I haven’t! And thanks for the heads up! Kate Morton is my favorite author of all time.